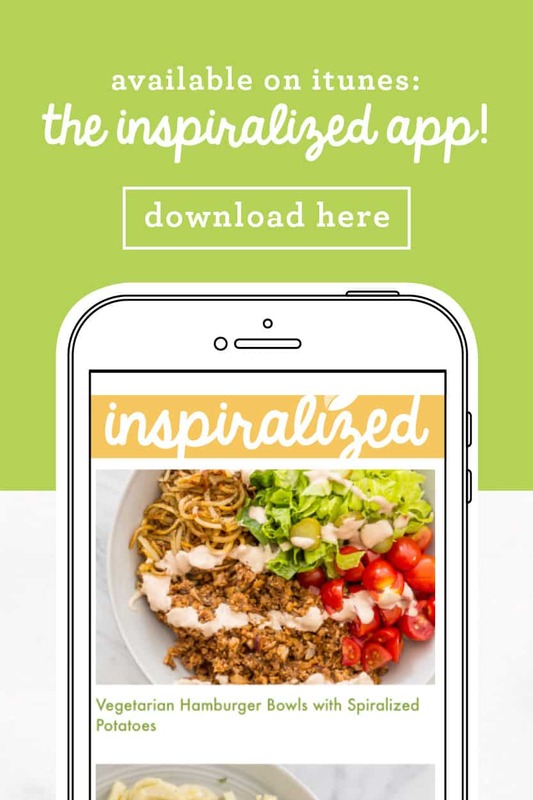 I’m especially excited for today’s blogger feature, not only because I love her, but because she’s cooking a recipe from my cookbook, Inspiralize Everything! Allow me to introduce Heidi Larsen, from foodiecrush! Heidi Larsen is the magazine designer turned photographer/writer/recipe creator/influencer at FoodieCrush.com, the blog and online magazine featuring mostly seasonal, often healthy recipes meant to inspire people to get into the kitchen and cook something good. 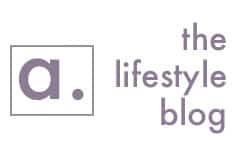 In addition to creating edible content for FoodieCrush, Heidi is also an influencer marketing consultant, food photographer and stylist, and award-winning art director for national clients, publications and partners. 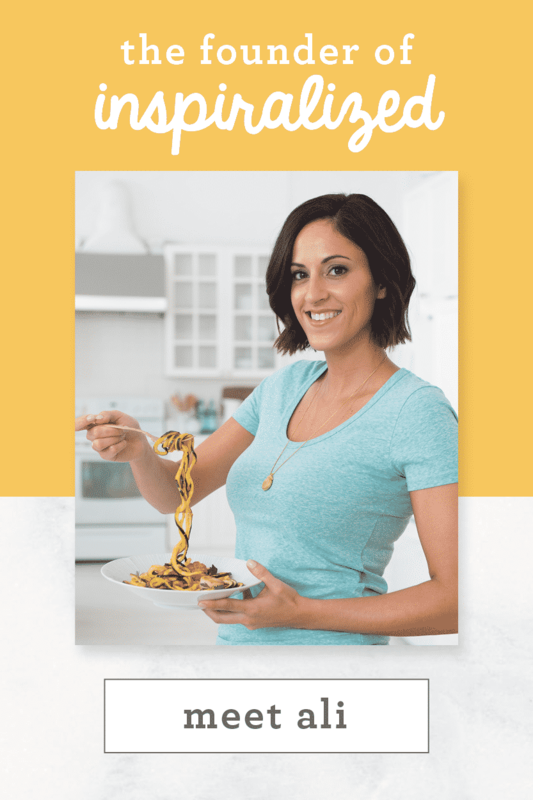 She recently self-published the Nourished Planner, a printed daily planner for people like her who crave inspiration and want to create order in their to-do lists, meal planning, and calendaring. Heidi lives in Salt Lake City with her husband, daughter, and three rescue mutts, all of whom make occasional appearances on FoodieCrush. There’s nothing better than helping someone in need, and if you’ve ever had a newborn, you know you need all the help you can get. 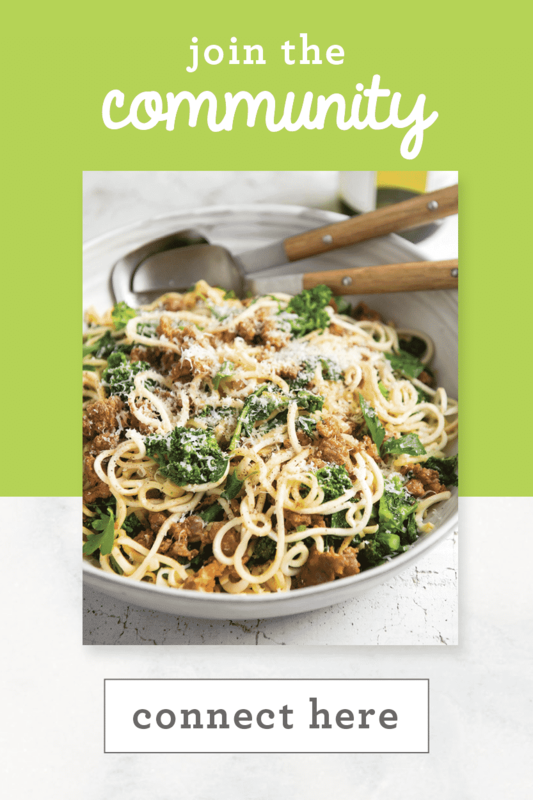 So when Ali asked me if I’d be interested in sharing a recipe while she was on maternity leave, I said yes in a heartbeat, because sharing recipes is a whole lot more fun than changing diapers. 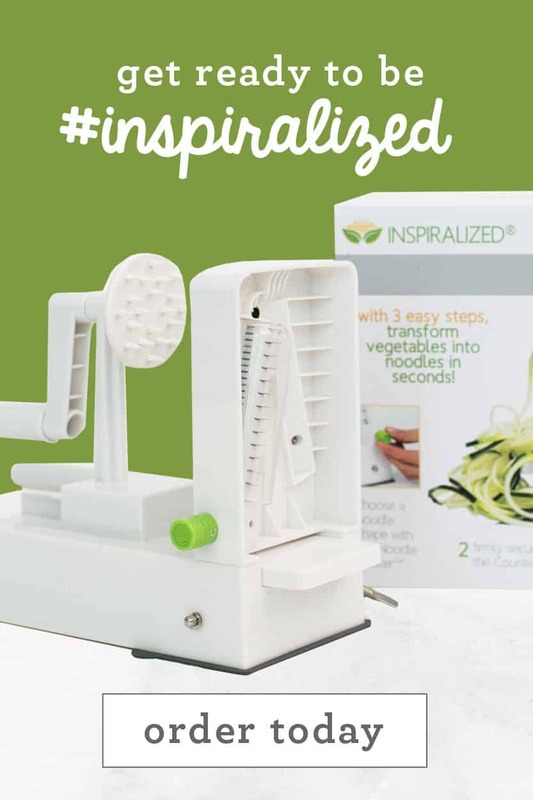 The Inspiralizer has become one of my all-time favorite kitchen gadgets because it inspires healthful eating and makes regular old veggies and fruits look totally unique. Plus, it’s really kind of fun to use. 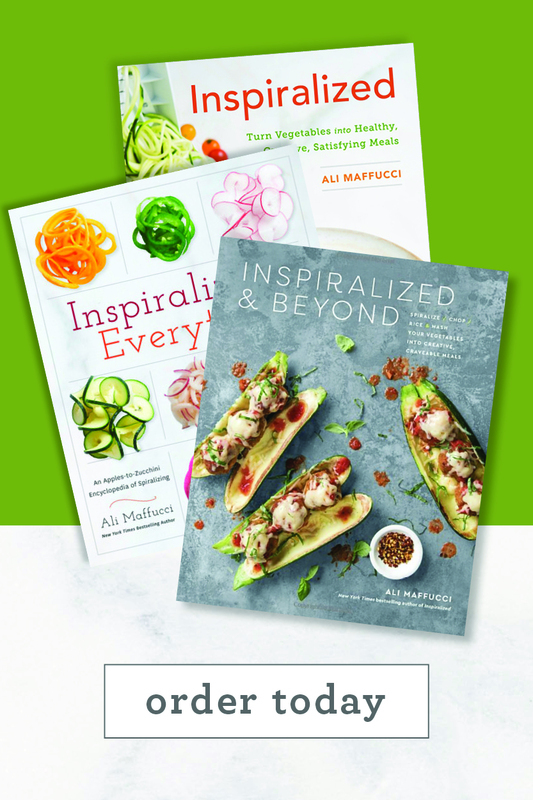 It’s no secret that Ali is an Inspiralizer genius and her two cookbooks are proof in the curly-cued veggie pudding. 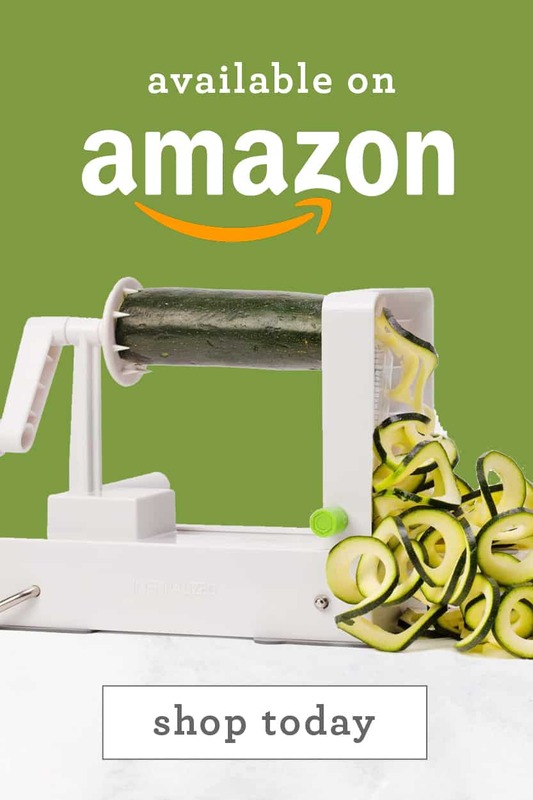 And thanks to the Ali and the Inspiralizer, I’ve been inspired to create this Thai Zucchini Noodle and Quinoa Salad recipe as well as this Caprese Zucchini Salad recipe from her first cookbook. 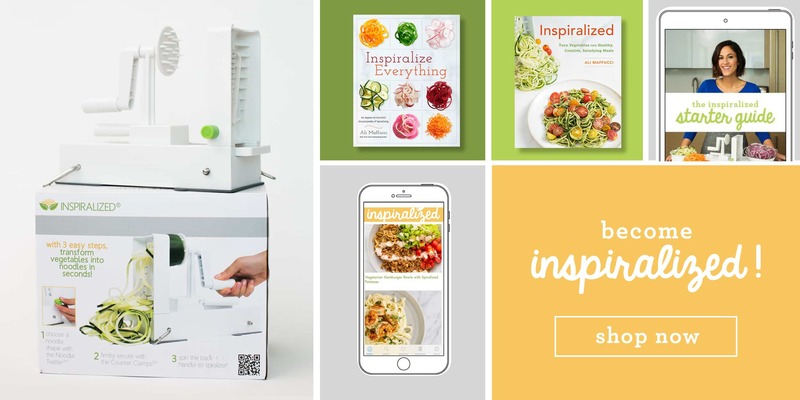 Now, from her second cookbook, Inspiralize Everything, I’m sharing this totally unique spin (literally) on what to make with leftover Thanksgiving turkey. 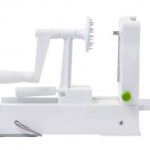 Because you can only eat so many turkey and stuffing sandwiches before the scale totally tips in the wrong direction. This salad is the epitome of fall salads and is totally filling all on its own. Naturally it’s a given to make and pull you out of your post-Thanksgiving Day rut, but because I love baking a turkey breast for my daughter’s weekly school lunches (this is my favorite way to bake an always juicy turkey breast) I can make this salad any old time I want. Spiralized squash is roasted in the oven so it lightly caramelizes and becomes sweeter in flavor while holding it’s earthy bite. In Ali’s original recipe, she used a large Asian pear to complement the fall flavors. 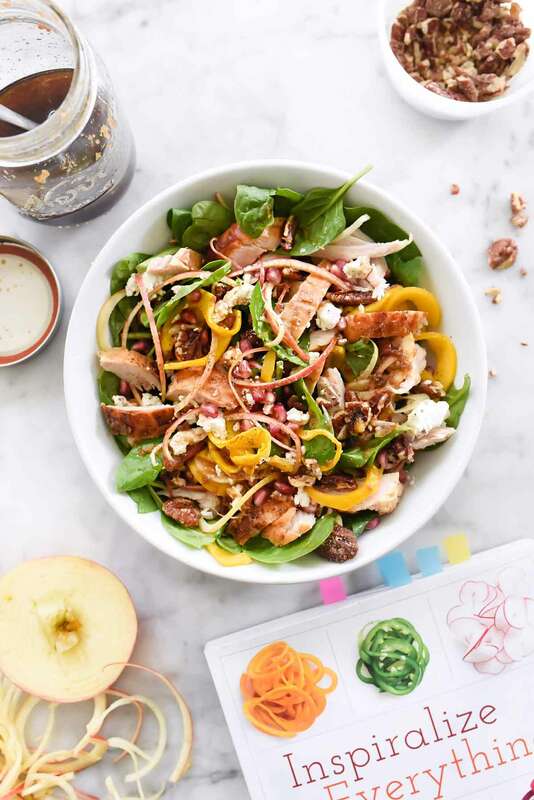 But true to form, I didn’t have time for the store-bought pears to ripen on the counter before making this salad so I used a crunchy Honeycrisp apple instead, and spiralizing it gave it a whole new apple-esqu appeal. Tip: If you’re spiralizing the apple in advance, store it covered in a bit of water with a touch of lemon juice so it doesn’t discolor. After spiralizing, be sure to trim both the butternut squash and the apple with kitchen scissors, cutting them into more manageable lengths. 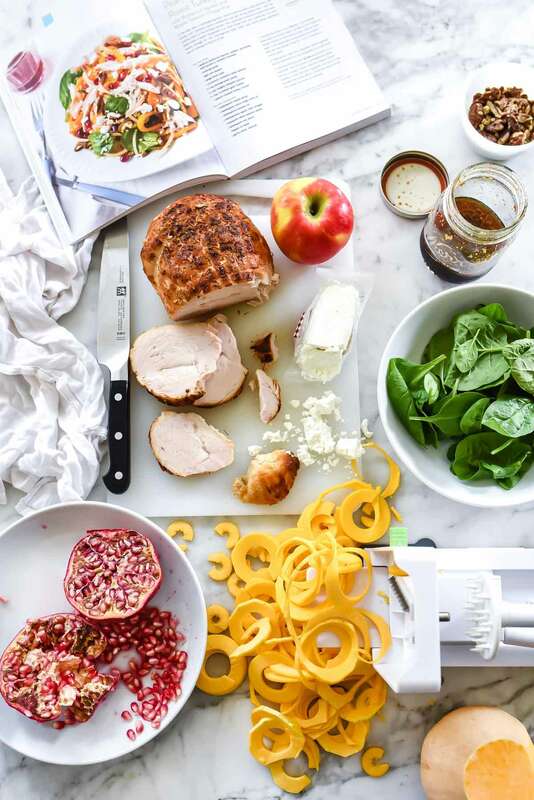 Bright pomegranate seeds add a sweet but tart bite to the earthy roasted squash and savory turkey and paired with pecans and goat cheese, it’s like a flavor explosion with each bite. I like to roast my pecans before chopping to deepen their flavor. To do so, simply add the whole or roughly chopped pecans to a dry fry-pan over medium-high heat. Let them cook for 1 minute or so undisturbed then move them around so they toast but don’t burn. Pull from the heat as soon as they begin to golden and become fragrant, then give them a rough chop and add to the salad. But the crowning moment for this salad may actually be the simple, Asian-style sesame-flavored dressing, sweetened with a bit of maple syrup. Ali calls for apple cider vinegar here, but I used rice wine vinegar instead. Either one would be totally interchangeable and absolutely delicious. My favorite way to make homemade salad dressings is to add all the ingredients to a small glass jar with a fitted lid, then simply shake vigorously until all the ingredients fold together. This makes it easy to store any leftover dressing with one less dish to clean, too. Preheat the oven to 400°F. Line a baking sheet with parchment paper and spread the butternut squash noodles on the baking sheet, spacing them evenly. Lightly coat with cooking spray and season with kosher salt and black pepper, Roast for 10 minutes or until they lose that raw flavor and are softened. Meanwhile, make the vinaigrette. In a small bowl or a jar with a tight fitting lid, add all the vinaigrette ingredients and either whisk or shake the jar until the ingredients are emulsified. Set aside. 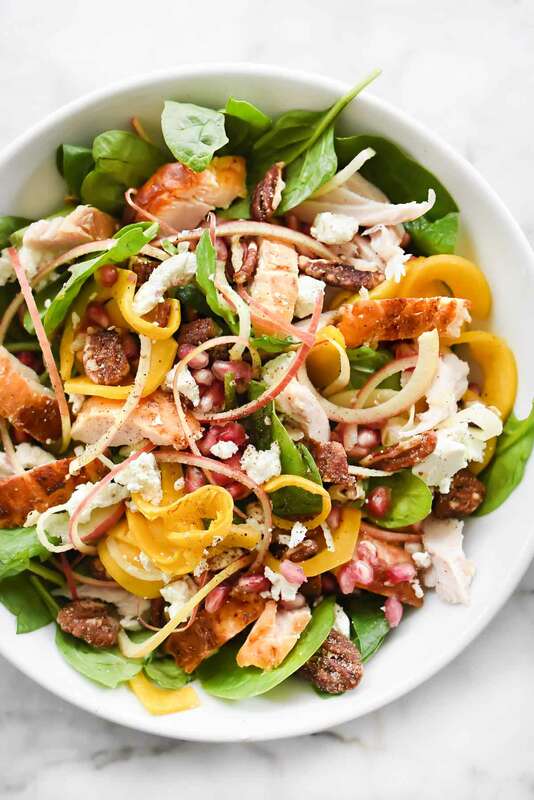 Add the spinach to a large serving bowl with the spiralized apple or pear, butternut squash, and the turkey. Top with half of the pomegranate seeds and pecans and drizzle with the dressing and toss to coat. Top with the rest of the pomegranate seeds, pecans and the goat cheese, season more to taste and serve. This salad was really delicious. My whole family loved it! That's so wonderful to hear!! Thank you for trying it!